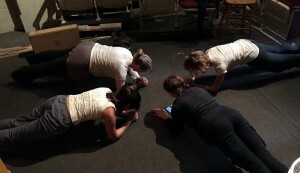 "The ladies plank every day. Boys refuse to do it. They don't want to get beat by the girls." "There's so much busy work on this show. So much [waitress] stuff! Food. Plates. Ketchup. And we're still working on lines. It's bootcamp for the mind. Its good though because for them [waitresses] it is like autopilot. And we are so lucky to be working on the set so early." Kind of like rubbing your stomach and patting your head at the same time.